Properties in Aschau (Chiemgau) Station average 4.6 out of 5 stars. 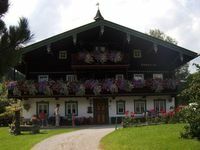 Bucherhof idyllic single location near the forest with a private lake, pure nature. Property 1: Bucherhof idyllic single location near the forest with a private lake, pure nature. Near Chiemsee: Family friend. Holiday on the 4 star farm, 3 bedrooms. Property 5: Near Chiemsee: Family friend. Holiday on the 4 star farm, 3 bedrooms. Bucherhof idyllic single location near the forest with its own lake, pure nature. Property 8: Bucherhof idyllic single location near the forest with its own lake, pure nature. Gorgeous apartment with a stunning view. Samantha and Arne have done an amazing job of transforming their historic property into a modern space. Yet the historic is maintained with exposed parts of the old building. They are a very friendly couple and Heidi their dog is sweet too! In a group of farm houses and modern homes it combines Bavarian country with the conveniences of a larger town. We loved it!!!! We had a wonderful time in Rupholding, so much to do and the hosts were so helpful and kind. Loved the bbq and patio and the modern kitchen. Very comfortable beds, a great place to rest after a day of fun activities, swimming, biking trails right out the front door, and a fun coaster ride so close!